The App Store has experienced slow but steady growth of subscription-based publications since Apple announced the iOS feature in February. 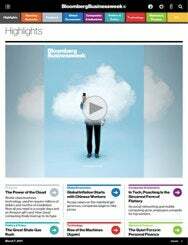 On Monday, Bloomberg added to the stack by releasing a Bloomberg Businessweek+ app. Bloomberg Businessweek+ is a multimedia edition of the weekly magazine focused on all things business, designed for the iPad. You can read a full digital version of the magazine that is optimized for both landscape and portrait viewing, and exclusive video for each issue offers interviews with editors and the creative director about the feature story and design process for the cover. Tapping on a company name in any article will display the latest market information and news about it. You can customize your archive to keep certain issues just a tap away. Text can be resized, and articles can be shared via the typical options of Twitter, Facebook, and e-mail. Bloomberg is charging $3 per month ($36 per year) for its iPad subscription, which is quite the deal, considering each weekly issue costs $5 and a yearly print subscription straight from Businessweek.com is $40. Current print subscribers can get access to the iPad edition for free after validating their accounts. Apple’s subscription features for iOS apps have been met with mixed reactions, but Oke Okaro, Bloomberg’s global head of mobile, told paidContent in a recent interview that the publication was “very pleased with Apple’s terms.” While some publishers have deemed the demand for iPad and App Store subscriptions too big to ignore, others have complained about the opt-in approach for gathering subscriber information, as well as the limited details that Apple allows publishers to collect about customers. Some service providers, such as Rhapsody, have called Apple’s rules “economically untenable,” since they cannot afford to pay Apple 30 percent of their revenue in addition to their content licensing agreements. Amazon, a company that might be in a similar situation to Rhapsody with its Kindle book reading app and store, has yet to update its app or comment on Apple's subscription rules. However, there is some debate as to whether Apple’s rules will apply to companies like Rhapsody and Amazon. According to one of Steve Jobs’s alleged e-mail replies to customers, subscriptions are only for publishers, not Software as a Service (SaaS) providers. So far, though, Apple has yet to clarify its subscription terms to help define whether they will affect apps, services, and stores from companies like Rhapsody and Amazon. In their current iteration, Apple's rules require all relevant apps to comply by June 30. With Bloomberg's release on Monday, Businessweek joins a growing list of subscription-based apps in the store, including Spin Play, Popular Science, Elle, Maxim Magazine, Nylon, and more.